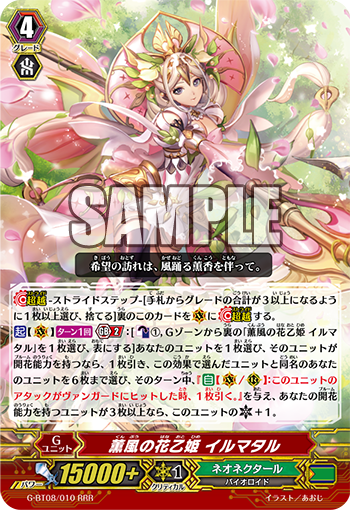 ACT V 1/Turn GB2 : [CB1, choose 1 face-down “Flower Princess of Summer Breeze, Ilmatar” in your G-Zone, and turn it face-up] Choose one of your units, if that unit has the Bloom ability, draw a card, choose up to 6 of your units with the same name as the unit chosen with this effect, until end of turn, those units get “AUTO V/R: When this unit’s attack hits a vanguard, draw a card.”, and this unit gets Critical + 1 if you have 3 or more units with the Bloom ability. Remember, Vanguard cards operate under “do as much of the effect as possible” – this means that choosing a non-Bloom unit simply doesn’t give you the draw 1. It’s a little harder to word it in English just ‘cuz of how Vanguard card effects are written, so here’s my little addendum. Today’s card is a new 《Neo Nectar》 G Unit from “Absolute Judgement” (on sale August 26th, 2016)! It’s “Flower Princess of Summer Breeze, Ilmatar”, who shows their true worth when you combine them with 【Bloom】!! 【Bloom】 is, the clan ability of 《Neo Nectar》, and activates when a Unit with the same name is placed on the field. By using cards like “Ideal Maiden, Thuria” who are treated as having the same name as an ally when placed, you’ll be able to Bloom one ally after another! Today’s card is “Flower Princess of Summer Breeze, Ilmatar”, who can develop the plays of Rearguards that possess 【Bloom】, in that you can choose an ally, and if they have 【Bloom】, you get to draw 1. And, all Units with the same name gain a “When this attack hits, draw 1” ability! By granting high power Rearguards like “Green Shot Elf” and “Pure Maiden, Katrina” this ability, you can aim to draw. And if you have 3 or more Units with 【Bloom】, “Ilmatar” gains Critical+1! “Ilmatar” has a tactical buffing ability that puts pressure on your opponent to guard. Not only do they have to Guard a Critical+1 attack, but with your Rearguards wielding a draw ability, you can connect this card to trumps like “Ranunculus in Glorious Bloom, Ahsha” later on. Of course in a Deck overflowing with 【Bloom】 Units, this card allows for a strong attack in tandem with the abilities of your Rearguards! Strengthen your 【Bloom】 Deck by using “Summer Heat Flower Maiden, Marjukka” and “Cornflower Flower Maiden, Ines”, so be sure to try them out!